After Wednesday's trip to Canberra, we're staying in Australia for another sign. As it happens, a crap one this time. 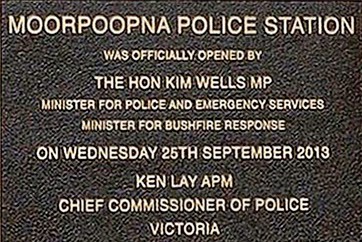 It was unveiled this week in the small town of Mooroopna in Northern Victoria at the opening of the new police station there. I wonder if there actually is Moorpoopna Police Station than anywhere else? Like a pig sty, for example.